We want to over-emphasize that neither Donna not the interviewees are doctors, and that we’re sharing experiences rather than medical advice. We’re not intending anything here to be a diagnosis of any sort, and urge people with pain and injuries to consult their doctors. Run strong. DONNA: Hi Cristina. Plantar fasciitis, huh? CRISTINA: Yes! On my right heel! It started kicking in October 2017, and was full throttle by January 2018. DN: How do you think it happened? CM: Might have been an old pair of shoes combined with not stretching properly…also combined with wearing flat-soled shoes when not running. DN: Describe what the pain felt like. CM: Like someone was stabbing me in the foot with a very sharp knife, on the bottom part of my heel, jabbing upward. It was very bad in the morning and after running, and if I had been on my feet all day, the pain would accumulate. DN: OMG, I feel your pain! That sounds so awful. You went to several doctors, right? CM: Yes, when the pain had become constant, even while just walking. I searched the Internet looking for therapies to try on my own first. Sleeping with the Strassburg sock on every night helped a little, but not enough. The dorsal night splint is too rigid to sleep with, and did nothing except make sleep uncomfortable. I'm on my feet a lot at work on certain days, and it's really hard to do my job with pain shooting up my leg. The first doctor I saw was a physical therapist who recommended exercises, laser treatments, massages, and KT tape – but even with regular visits I don't feel like it did anything! I didn't run for a month and a half at their recommendation, but during that time the pain actually got worse. When the pain while walking got intolerable, I went to a podiatrist, Dr. Lori Weisenfeld. She confirmed yep, it's probably PF, but she sent me for X-rays to guarantee I didn't have any stress fractures or bone spurs (negative on both counts). First, they tried strapping which helped a little, but it didn’t stay on because I sweat too much on my feet. I was in so much agony that I asked for a cortisone shot. A needle to the foot was a terrifying prospect but I needed the pain to go away and I was willing to do anything. That was the first relief I felt in MONTHS, and it made such a difference. I had no idea how irritable I had become while dealing with chronic pain. The drawback is the shot doesn’t last long. The pain returned within a few days. DN: All this sounds like it could be expensive. CM: It was, but the pain was so intense I felt like I had no choice. You are allowed three cortisone shots total for the entire year; after that, they cut you off. Too many injections could lead to tissue damage so they are very cautious with it. That’s when I decided to get custom orthotics, which my insurance only covers if I am diabetic (which I’m not), so that was $750 out of pocket! In the meantime, I tried Superfeet but they didn't quite do the trick and were squeaky. Dr Weisenfeld had me bring in all my shoes for evaluation – the only acceptable ones were my Brooks Ghost shoes. I had just gotten a pair of the Nike Pegasus that were deemed unacceptable so that was kind of heartbreaking to hear since they were so new! DN: Interesting. What was it about the Brooks shoe that made it acceptable to your podiatrist? CM: They have sufficient heel-to-toe drop of 12mm. My heel needed to be lifted, and my arch had to be supported. The Brooks Ghost did that better than the others. Dr. Weisenfeld convinced me to wear them all the time (not just running), which I do now, even if they don’t match what I’m wearing. DN: What was your breakthrough? CM: Besides the orthotics, the big breakthrough was the podiatrist recommending a chiropractor – Dr. Ron Safko. He did some ART on my calf that broke up so much tight calf muscle that I cried/laughed/howled in pain. Miracle of miracles, it started to get better. DN: Oh, wow. ART seems to be a controversial therapy yet you achieved results. Did you also get any spinal adjustments? CM: Yes, he had me lie on my side and he “popped” my hips somehow. He was especially interested in any previous injuries I’d had, and the imbalance he noticed between the length of my left and right legs. I had some hip pain a few years ago. Everything’s connected, and imbalance will affect your gait over time. He had me doing some yoga-like exercises to open up my hips. But most of my relief came from the deep tissue massage. DN: You’re a really active person, and you’re a cyclist too. How long were you sidelined? What did you do to not go crazy/keep up your fitness? CM: Once I went to the podiatrist and got orthotics, I started running again in March 2018. 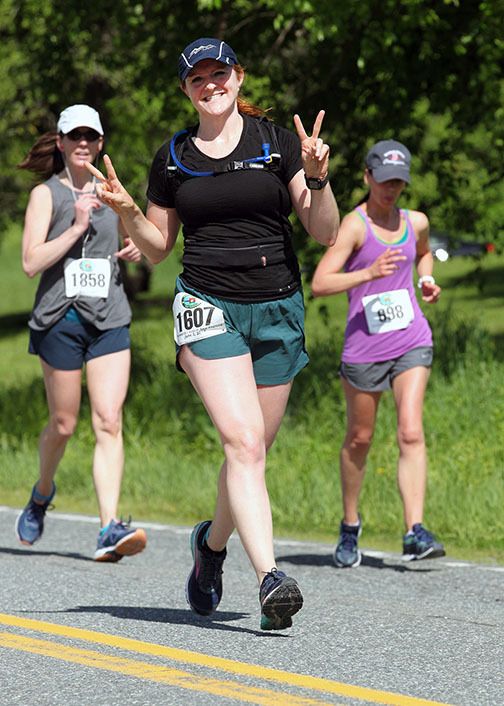 I had a half-marathon scheduled for June that I was determined to run. The podiatrist gave me the go-ahead, but instructed me to run with the orthotics in! It felt a little weird at first, but I got used to it with no problem. Since I was so worried about the pain returning I continued to wear my running shoes with the orthotics everywhere, even at work. In terms of not going crazy: I do many other activities, such as flying trapeze, trampoline, and cycling. I just can't stop entirely. Thankfully none of these triggered the PF (not even the trampoline! ), so I was good to keep up with those in the meantime. I still wear my running shoes all the time (no flat shoes anymore for me), but I have taken out the orthotics in case the PF comes back - I can't really afford to get another set, so I’m trying to save them for now. DN: What do you recommend in terms of helpful self-care for people with PF? CM: Everyone’s different, and you have to find what works for your body. For me, the chiropractor showed me the soleus muscle, and how necessary it is for me to keep stretching it out. Between biking and running, my calves are very, very tight and that’s what caused the plantar fasciitis to go into overdrive. Certain calf stretches just don't do it for me (standing & wall calf stretches, towel stretches, downward dog - none of these do anything), so I have to really bend down and press in to feel the stretch properly in my soleus. It's one of my go-to stretches after a run, no matter what. Eccentric calf raises and drops on the edges of steps are good, especially right after a run. ART helped as well. I would go back and get it again if I felt like my stretches weren't doing the trick. Once you know where that tightness is on your calf, you can wriggle around until you start to feel the stretch. Also: Rolling. I didn't know how to roll my calf until I was shown by a friend, here’s a good video that shows two different approaches. I use the one leg across another rolling technique to really dig in and massage that area. I still feel twinges now and then, a sort of nagging reminder of what could happen if I don't take care of things properly. I don't ever want to feel that level of pain again. DN: That’s an amazing recovery story and great advice, Cristina, thank you! By the way, how’d you do in your half-marathon? CM: I got a PR!